Southern Illinois University Edwardsville students will forgo sleep as part of fundraising efforts to help children fighting cancer and other life-threatening illness. SIUE students will take part in the St. Jude Up ‘til Dawn event on Saturday, Dec. 3 at the Morris University Center Meridian Ballroom. It is an annual fundraising program, hosted nationally by colleges and universities to raise money for the kids of St. Jude Children’s Research Hospital, according to Cathy Passananti, associate director of the Morris University Center and Student Success Center. The event involves team competitions, dancing, videos featuring St. Jude patient stories, prizes donated from community businesses and more. Click here to donate or register for the event. 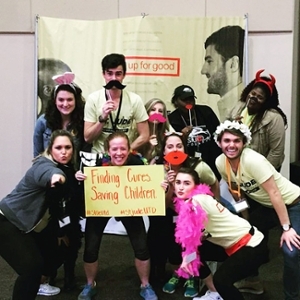 SIUE has been a part of the St. Jude Up ‘til Dawn program since 2006 and has helped raise more than $235,000. “No family pays a dime for the services and treatments provided at St. Jude Children’s Research Hospital,” said Passananti. “It’s only possible because of the kind donations from people worldwide. Currently, there are more than 190 students signed up to participate. For more information, contact Passananti at cpassan@siue.edu or 618-650-2301. Pictured are St. Jude Up ‘til Dawn 2015-16 executive board members. Front row from left to right: Olivia Cano, Bekah Abbott (holding sign), Jenna Kot, Allyson Armstrong and Dylan Stanley. Back row from left to right: Kristin Leigh, Austin Stephens, Kailey Cobern, DeAndrea Washington and Melissa Royster.